In a medium bowl, sift together flour, cocoa powder, baking soda and salt. In a large mixing bowl, using a mixer on medium speed, beat together butter and sugar until creamy - about 1-2 minutes. Beat in vanilla and egg until combined. Reduce mixer speed to low and beat in dry ingredients until combined. Beat in melted chocolate chips until combined. Divide dough into 14 balls. Flatten a ball in the palm of your hand and place an Oreo in the center; evenly wrap dough around Oreo. Repeat process with remaining dough and Oreos. Place balls on sheet pans and bake 10 minutes or until puffy and set. Transfer cookies to wire racks to cool. 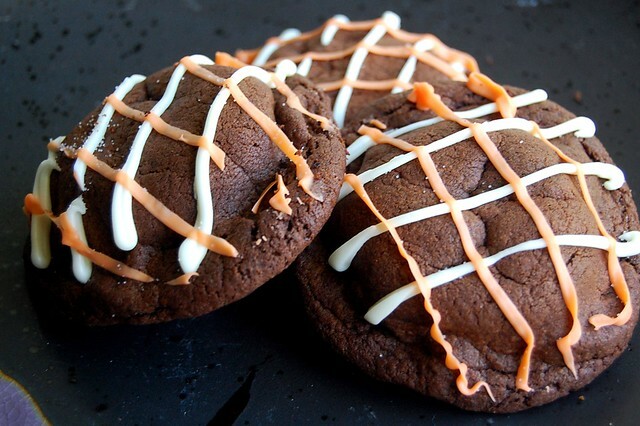 Drizzle melted white and orange chocolate over cookies. 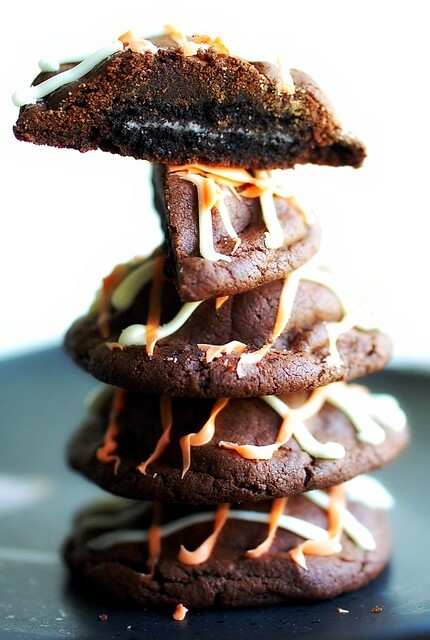 41 comments on "Oreo Stuffed Double Chocolate Cookies"
looks really good. My little boy adores anything oreo ! Cute idea and lovely photos. Yum these look delicious! A cookie stuffed with another cookie - inspired! Wow! 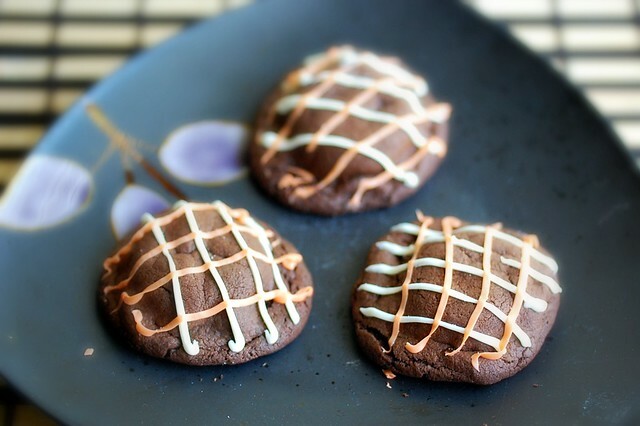 these cookies are truly decadent!!! what a fantastic idea! this is definitely my kind of cookie! Genius. Simply. My cousin will make me a statue and praise me every day if I make these for him! i need to go for a run just looking at all the treats you've been baking up :) actually i've been doing plenty of baking too... eek! Um...cookies inside of cookies!?? Cookie heaven!! Hurray!! These are going to be made soon-yum! Can't wait! All that chocolate goodness! Delish! I'm not really into Halloween. So, not dressing up. Never had black walnuts. Got to give them a try. Now, you're just showing off! What beauties! But there's no way I would make only 14 cookies. I think I would triple the recipe and leave some of the unbaked cookie balls (not attractive sounding, sorry) in the freezer for emergencies...like 4 pm on a Thursday. The answer is no to every single question you asked. I better get moving. PS That Osage Orange looks like a round brain. That would be appropriate for your Halloween decor. I want one of those cookie in a cookie! YUMM! Yumm! These look amazing. I've seen oreo stuffed cupcakes but not cookies. These look really good. These look delicious and oh so festive! oh, you little vixen! you are KILLING me with the goodies! these look SO awesome! Yum! The only thing better than a super-chocolatey cookie is one with an oreo inside it!! A cookie stuffed cookie-very decadent! 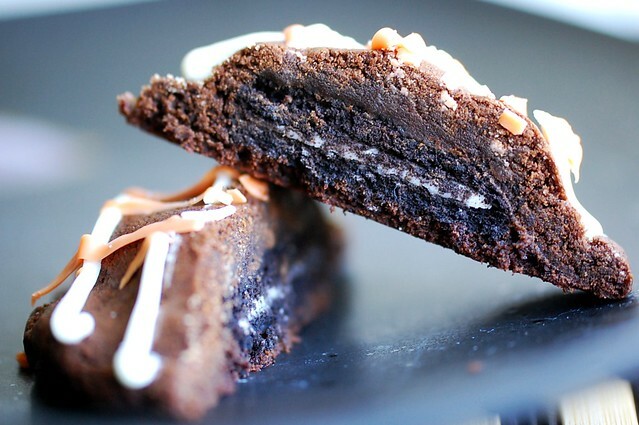 I make an Oreo stuffed brownie that are a big hit. Not a fan of the black walnuts-the taste was not good, or probably not what I'm used to. These cookies look yummy. How great would they be using Halloween Oreos. If I can still find them, I might give it a try. 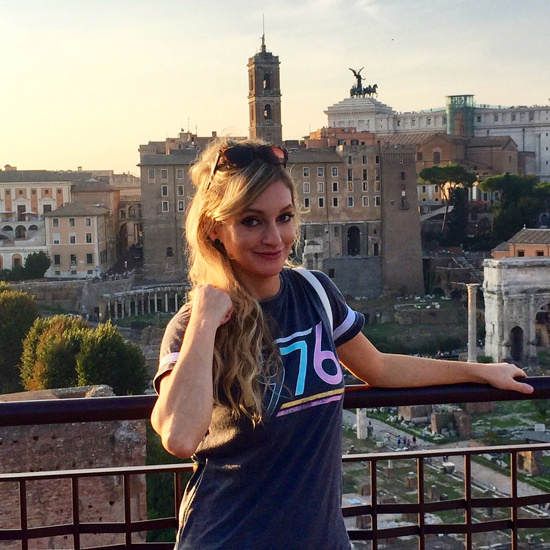 Thanks for the post, Emily! Those cookies are simply delightful! I had never seen one of those fruits before. Wow. Oh my heavens. That's deliciousness stuffed with more deliciousness!!! They look delicious and I love the orange and vanilla stripes on top. Such a delicious and unique recipe! 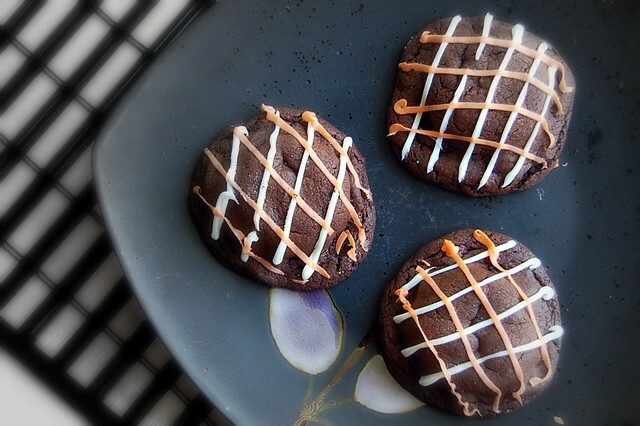 If there were anyone who would come up with a cookie inside a cookie, it's definitely you! My husband loves oreos, and I'd love them covered in another cookie like this! Delish! WOW! Those look seriously amazing! What a creatice idea! Thanks for sharing. Your writing is captivating as well! YUM! These guys look so tasty! And for your next race, sign-up! You won't regret it, I promise. Though I totally agree, running on a treadmill is the pits! Where so you come up with these ideas? These cookies are GENIUS!!! You are indeed right, a cookie inside of a cookie is always a good thing! Those look so good! I love oreos! Ok sorry for the rant :) Have a great Halloween! Aurora, you should send me the recipe for the black walnut cake! I'd love to bake it. ... great idea ! I tried them with my daughter and family and they loved them !! Thanks a lot ! You're right! I don't think you can ever go wrong with a cookie inside a cookie! I made them today. They're great! Can't wait to make another batch for Fuzz's class. Anna, WOW! I'm honored! Thank you for making them!